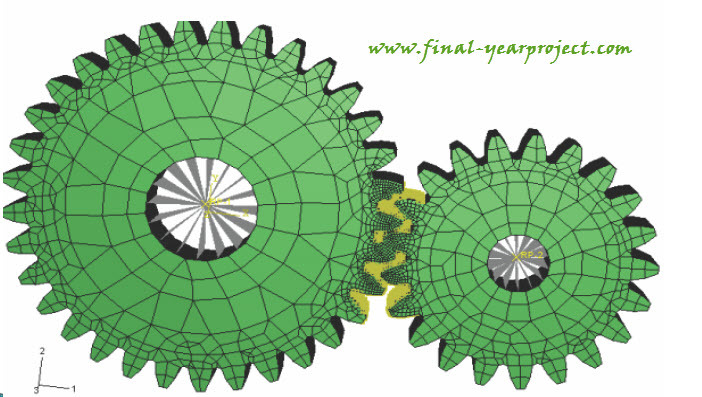 This is a good Mechanical final year project report on "Static & Dynamic Analysis of Spur Gear" which was submitted in the partial fulfillment of the degree Bachelor of Technology in Mechanical Engineering. This thesis investigates the characteristics of a gear system including contact stresses, bending stresses, and the transmission errors of gears in mesh. Gearing is one of the most critical components in mechanical power transmission systems. The contact stresses were examined using 2-D FEM models. The bending stresses in the tooth root were examined using a 3-D FEM model. You can also Subscribe to FINAL YEAR PROJECT'S by Email for more such projects and seminar. Spur Gears are the most common means of transmitting power in the modern mechanical engineering world. This thesis also considers the variations of the whole gear body stiffness arising from the gear body rotation due to bending deflection, shearing displacement and contact deformation. Use this thesis for your reference and study work.